The Easter Lily -- the Latin name is Lilium longiforum - is native to the southern islands of Japan. In the 1880's, it was widely cultivated in Bermuda and bulbs were shipped to this country. Around the turn of the century, the Japanese took over the annual growing exportation of Easter Lilies to the United States, and continued to dominate the U. S. export market until the start of World War II. Precise growing conditions are necessary since the Easter Lily bulbs must be cultivated in the fields for three, and sometimes four years, before they are ready to be shipped to commercial greenhouse growers. Those years, however, are not a carefree time for the bulbs nor for the growers. The bulbs are never dormant and require constant care and attention to assure superior quality and cleanliness. Each bulb is handled up to 40 times before it is ready to be shipped. 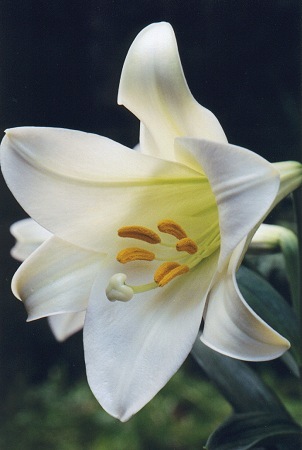 From the fields to the greenhouse to your home, the Easter Lily remains the traditional, time-honored flower of Easter. Symbolic of a resurrection, Easter Lilies rise from earthy graves as scaly bulbs, and bloom into majestic flowers that embody the beauty, grace and tranquillity of the special region from which they originate. When buying a lily, look for a plant with flowers in various stages of bloom from buds to open or partially opened flowers. Foliage should be dense, rich green in color, and extend all the way down to the soil line (a good indication of a healthy root system). Look for a well-proportioned plant, one that is about two times as high as the pot. You also should check the flowers, foliage, and buds for signs of yellowing (improper culture), insects, or disease. At home, keep your lily away from drafts and drying heat sources such as appliances or heating ducts. Bright, indirect light is best with daytime temperatures of 60 to 65 degrees F. Water the plant only when the soil feels dry to the touch, but don’t overwater. To prolong the life of the blossoms, remove the yellow anthers (pollen-bearing pods) found in the center of each flower. If you get this staining pollen on fabrics, don’t rub it off, but remove it with sticky tape. If you have cats, especially those that like to chew on leaves, keep your lily away from them. Any part of this lily, as many of its relatives, can cause kidney failure in cats. Eating even one leaf can be fatal to a cat, starting with them stopping eating, vomiting, and becoming lethargic. If you think a cat has eaten a leaf, call a veterinarian immediately as prompt treatment often can be successful. Each holiday is marked by cherished traditions that bring joy, comfort, and warmth, and provide continuity from one generation to the next. Easter has its share of traditions: egg decorations and hunts; gift baskets and chocolate bunnies, sunrise church services, parades, and, of course, the Easter Lily. For many, the beautiful trumpet-shaped white flowers symbolize purity, virtue, innocence, hope and life - the spiritual essence of Easter. History, mythology, literature, poetry and the world of art are rife with stories and images that speak of the beauty and majesty of the elegant white flowers. Dating back to Biblical lore, the lily is mentioned numerous times in the Bible. One of the most famous Biblical references is in the Sermon on the Mount, when Christ told his listeners: "Consider the lilies of the field, how they grow: they toil not, neither do they spin; and yet..... Solomon in all his glory was not arrayed like one of these." Often called the "white-robed apostles of hope," lilies were found growing in the Garden of Gethsemane after Christ's agony. Tradition has it that the beautiful white lilies sprung up where drops of Christ's sweat fell to the ground in his final hours of sorrow and deep distress. Churches continue this tradition at Easter time by banking their alters and surrounding their crosses with masses of Easter Lilies, to commemorate the resurrection of Jesus Christ and hope of life everlasting. Since the beginning of time, lilies have played significant roles in allegorical tales concerning the sacrament of motherhood. Ancient fables tell us the lily sprang from the milk of Hera, the mythological Queen of Heaven. A mark of purity and grace throughout the ages, the regal white lily is a fitting symbol of the greater meaning of Easter. Gracing millions of homes and churches, the flowers embody joy, hope and life. Whether given as a gift or enjoyed in your own home, the Easter Lily serves as a beautiful reminder that Easter is a time for rejoicing and celebrating.